The Index lists all the things that perished in Iraq’s 2003 war. Waddood, an Iraqi eccentric book seller is the author of the Index. 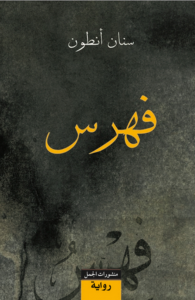 He gives it to Nameer, the narrator, an academic who is about to get his PhD in literature in the US, and who, in the novel’s opening, visits Iraq with a film crew as a translator. Nameer is disoriented by his visit to Iraq, and fascinated by Waddood and his work. He decides that the book he wants to write about Iraq should rest on Waddood’s life. He starts collecting newspaper clippings in view of his writing project. But the book never sees the light of day, as the more Nameer reads about the desintegration of Iraq, the less he knows how to write about it. As we follow Nameer’s American life, we read with him parts of Waddood’s Index. The parallel between the two voices are sometimes obvious, sometimes there are none. Ultimately, Nameer’s voice grows closer and closer to Waddood’s, as he loses faith in life more and more. Ultimately, Antoon’s last novel is the story of a book that cannot be written. In Waddoud’s Index, things speak and narrate their own life and death. Often, these passages take the form of a charade, where the reader discovers the nature of the object only towards the end of the passage. As even objects are attributed emotions, the reader gets a strong sense of the true meaning of loss. Despite Nameer’s life in the US being quite fulfilling on paper – a professor of literature in a respected New York institution, in a relationship with a wonderful young woman – he is consumed by this sense of loss. Index is a novel about the disintegration of a homeland, and the impossibility to capture it. Antoon’s fourth novel has been hailed as his best so far by the Arab press and was in its third edition barely six months after its publication. I can still remember the first time I flew. My three siblings were flying happily in the sky, oblivious to me. My heart was pounding, as if it were also worried its wings might let it down, as if, like me, it was torn between the fear inside me, which kept me in or close to the nest, and an overwhelming desire that compelled me to be like the grown-ups. I moved forward warily to the edge of the branch, which dipped a little with my weight and the weight of my mother behind me. I didn’t look down. I looked up, where my father was circling in a clear, cloudless sky. I spread my wings, then looked back toward my mother. She didn’t say anything this time but her eyes gave me courage and she kissed my head with her beak. I remembered how she had often told me that we have strong wings and that my wings would one day carry me to distant lands. I looked ahead and plucked up all my courage and flapped my wings with vigor. I couldn’t believe myself. I flew with confidence, as if I had often flown before. The cold air swept past my white feathers. The whole sky was mine and the whole world was laid out below me. With a flip of a wing I could twist and turn, rise and fall. I kept flying till the sun bade us farewell. I was the last to come home that day. I laugh now, and I’m embarrassed too, when I remember that moment and the fear that later left me. Here I am now, flying with the grown-ups for days on our journey to the warm lands. He’s not interested in being translated or published. So why is he sharing his manuscript with me so readily? Does he care that much what a stranger thinks? He’s strange, this Wadood. I folded the letter up and put it in the notebook I had bought specially to record my impressions of this visit. It had large pages that were slightly brown. The edges were stitched and trimmed unevenly to look like an old book. It had a thick cover of buff leather and a thin red ribbon attached to the top of the spine as a place marker. The marker was still on the first page, where I had written just one word since arriving: Baghdad. I envied Wadood his productivity. I don’t know how to start. In the end all this concern, or rather obsession, with writing rituals and instruments leads only to blank pages and silence. This visit had of course been hectic and hurried and the pace of the work and the daily travel exhausted me physically and mentally, leaving me no time to write or even to think calmly. I hadn’t yet started to deal with the whirl of scenes and people and ambivalent emotions. Even so I should have written something. One sentence at least. Every night I came back tired and sat on the bed. I picked up my pen but didn’t manage to write anything. The first night was the only night I wrote anything – that one word Baghdad.